Two customized high-gain 2.4GHz 7dBi Panel antenna. Two customized high-gain 2.4GHz/5.8GHz 8dBi panel antenna (Unobstructed, free of interference). Two customized high-gain 2.4GHz/5.8GHz 8dBi Omni-directional antenna with installation hardware. Easy install, no need to drill the remote control or drone, avoid out of warranty. We prefer Panel antenna for pilots who’s need for long range but it more straight direction pointing to your aircraft when during up to the air, this need more skill to handling for the best range. We also prefer dual band Omni-directional for who’s need to use for Filming Production/Rescue/Research team because the Omni-directional antenna more surround range. Because 2.4GHz is more crowed doing at the city, but in open area the 2.4Ghz signal is stronger than 5.8Ghz. 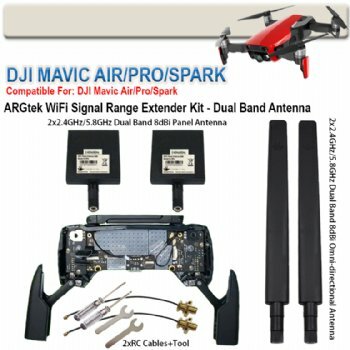 The dual band antenna is multiple band so you can take off your aircraft anytime to flight and when you have interference affect then just simply go into DJI Go 4 app by tapping (HD) to swap between 2.4GHz or 5.8GHz channel to continue your flight. But the pilots still need to do their own judgment, because difference pilots is flying on difference environment location. The 2.4GHz and 5.8GHz single band antenna is stronger than dual band antenna, but you need to switch between 2.4GHz and 5.8GHz antenna before take off your aircraft.